A world class spa, a private beach, and a restaurant by the famous Gaston Acurio... the Mandarin Oriental is a Miami hotel not to miss! Miami. It’s a city whose name conjures up familiar images of bronzed bodies, neon colors and sandy beaches in the minds of many people. Even if you have never been, you probably feel like you know it somehow thanks to the colorful, sultry images from movies and television. It is one of Americas more exotic cities – more Caribbean or Latin American than any other American city, and we were so excited to return! The city’s streets are hot, humid, bright and busy. Their soundtrack is like an energetic salsa, and by passing through its neighborhoods you will be transported in turn to Cuba, Haiti and a multitude of Central and South American countries. Our trip this time brought us to Miami as it was the endpoint of a cruise we had taken, and we couldn’t pass up the opportunity to spend a few days. Our hotel – the Mandarin Oriental, Miami – was located on Brickell Key, an exclusive high-rise area built on a man-made island. The wider Brickell area is part of Downtown Miami, and so the hotel’s most eye catching feature was its view across the water to the skyscrapers. You are far enough away to feel detached from the hustle and bustle on the other shore, but close enough to see people and vehicles moving quickly back and forth. That view is also what makes the lobby such a breathtaking space that wows you on arrival. Walls give way to windows which run from floor to ceiling, letting light flood in as well as demonstrating to guests just how special the hotel’s position is. On the other side of the glass are palm trees, the tranquil sea and the towers of the city. At night it takes on a different feeling as the lights of the skyscrapers reflect off the water and illuminate the sky. The views are shown off best in the lobby but they can be found throughout the hotel. They make the most of the tropical weather as well, by making their outside areas stunning to look at and incorporating a large pool, a lawn and even a man-made beach (the only private one in the city). The decoration and atmosphere feels elegant, but the overall vibe is relaxed and comfortable. While the soul of the hotel is purely Miami, there are also Asian hints tastefully thrown in. It is a combination of influences which I like, and which allows me to eat fresh sushi accompanied by Cuban cocktails. Our room felt light and spacious due to its large window, cream walls and furnishings. Axel was well catered for thanks to the cozy crib and other assorted amenities the team provided, and there was even a teddy bear left on the bed when we arrived. 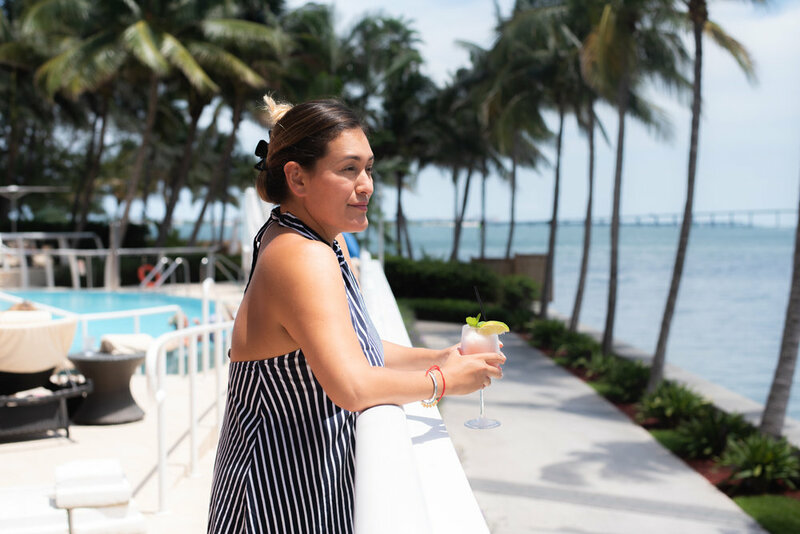 Best of all were the stunning views of the water and city skyline, which we were able to take full advantage of thanks to the generously sized balcony, all painted white with matching sun loungers, it felt quintessentially Miami. 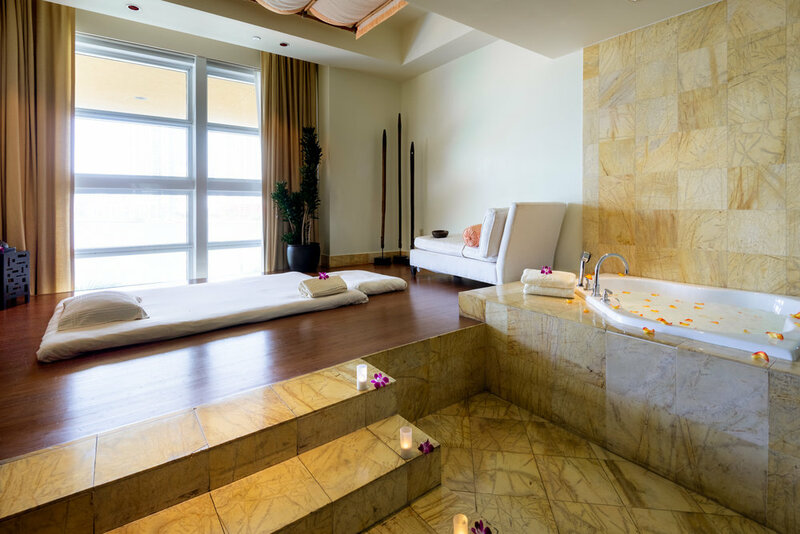 The Mandarin Oriental group prides itself on its hotel’s spas, and having experienced them before there was no way I would be missing this one. It was a good thing I didn’t as the Thai massage I got there was one of the best spa treatments I have ever had. Using a combination of rocking, acupressure and stretching, it was designed to relieve muscle tension which was exactly what I needed. My usual choice is a deep tissue massage, but after carrying a 20lb baby around for months my back and shoulders were feeling tender. This removed a lot of the pain and coupled with the tranquil ambience of the spa, I came out feeling relaxed and reinvigorated. The spa offers an array of massage and beauty treatments (and uses my favorite beauty products – Biologique Rechere) so if I had more time I would probably have gone back for more. There are a couple of dining options depending on what you are looking for. La Mar is the hotel’s main restaurant, and the Pool Café serves lighter meals like sushi, sandwiches and salads. Snacks are also available at the Mandarin Oriental’s two bars if you want something sophisticated to soak up your cocktail. Breakfast is served in the restaurant and guests can opt for either a buffet or a la carte options. Either way, there are plenty of healthy and savory things to choose from. Being in Miami, the hotel could have chosen to base La Mar’s menu around the cuisine of any of a number of Latin American or Caribbean countries, but they went for perhaps the most sophisticated option – Peru. Not only that, they got one of the country’s most esteemed chefs to design the menu – Gaston Acurio – so you can be sure that you will come away not just full but also extremely impressed. 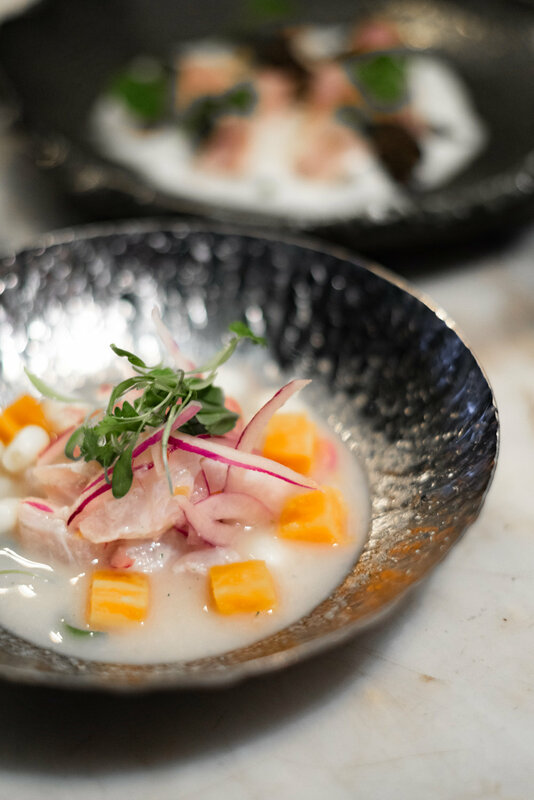 You can’t miss the ceviche (order as much as you can), and pair it with the restaurant’s take on the Pisco Sour. After dinner head up to the MO Bar, or go straight there and make their sushi your evening meal. We don’t normally spend much time in hotel bars as getting out and seeing what a destination’s local establishments are like, is a part of the experience. At the Mandarin Oriental however, we always make an exception; Each Mandarin Oriental’s signature bar we’ve ever visited – all around the world – has been something special. Their cocktails are amazing assortments of the local flavors and the time honored classics, with an atmosphere that is always fun and cosmopolitan.This one was no different and we ended up spending a few evenings there. The hotel’s location makes it easy to get out and see the city’s attractions. Brickell is a good place to start, and there are several museums and historic buildings hidden amongst the skyscrapers. Most will want to head straight over to Miami Beach however, to see the famous art deco buildings and soak up the atmosphere. Or, if you’d prefer to keep it low-key, one of the best options available to you at the Mandarin Oriental is to go on a picnic. The hotel will prepare a basket of goodies for you which you can take with you to any one of Miami’s picturesque spots. If you don’t want to venture far, the hotel lawn is as nice a spot as any to enjoy some nibbles and wine. We were so glad that we had stayed in Miami at the end of our cruise, and that we had chosen the Mandarin Oriental as a base. With a world class spa, one of the city’s best restaurants and Miami’s only private beach you really can’t ask for more. 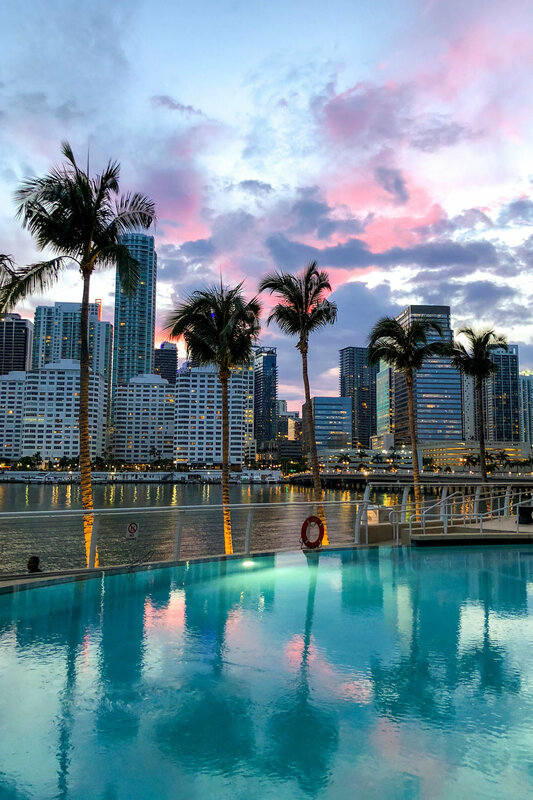 Add in the spectacular city views, and you have quite the hotel as your base for exploring Miami.